Please note that the content of this book primarily consists of articles available from Wikipedia or other free sources online. 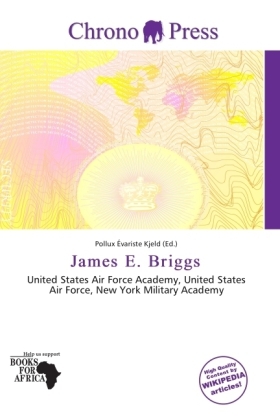 Lieutenant General James Elbert Briggs (May 5, 1906 February 25, 1979) was a United States Air Force general who served as the second Superintendent of the United States Air Force Academy.He was born in Rochester, New York in 1906 the son of Bendsmin Robert and Marion Cypert Briggs. He entered the New York Military Academy in 1920 and, as an honor graduate, in 1924 received a presidential appointment to the United States Military Academy at West Point. He was "cadet first captain" (regimental commander) his last year at West Point and graduated 31st in a class of 261 in 1928. He was commissioned a second lieutenant of Field Artillery.